Dennis Murphy checks in all the laptops that have been turned in so far. Photo by Isaac Parrish. [dropcap style=”flat” size=”2″]A[/dropcap]s the school year comes to a close, students are required to return the laptops provided to them. [permalink id=”https://www.cpsk12.org/cms/lib/MO01909752/Centricity/Domain/32/End%20of%20year%20laptop%20return%20fixed.pdf” target=”blank”]Instructions[/permalink] are on the front page of the [permalink id=”https://www.cpsk12.org/rbhs” target=”blank”]RBHS website[/permalink]. So far, one of the heads of the media center, Dennis Murphy, reported that there are yet to have been any issues with returns by the students. So long as kids follow the [permalink id=”https://www.cpsk12.org/cms/lib/MO01909752/Centricity/Domain/32/End%20of%20year%20laptop%20return%20fixed.pdf” target=”blank”]instructions[/permalink] provided, there should be no issues. Some students, like juniors Wolf Schaefer and Laura Scoville, are hesitant to turn in their computers. This year was Schaefer’s first experience with a laptop of his own, and he enjoyed its versatility and convenience for being able to work anywhere. Scoville sympathized with his opinion, saying it seems pointless to hand them in only to get them back two or so months later. Regardless of their stances, both students plan to transfer their data from their school laptops to new locations in anticipation of no longer having access to it. “I’ve decided to save a few OneNote notebooks from my classes and I’m going to export them into my google drive,” Scoville said. Schaefer intends to transfer data for his video games and calculator onto a personal flash drive. For those who want to export their data into a personal Google drive (separate from that of your school account) like Scoville, Murphy said there are instructions on how to do so that can be found by clicking on links in the [permalink id=”https://www.cpsk12.org/cms/lib/MO01909752/Centricity/Domain/32/End%20of%20year%20laptop%20return%20fixed.pdf” target=”blank”]instructions[/permalink] mentioned earlier. 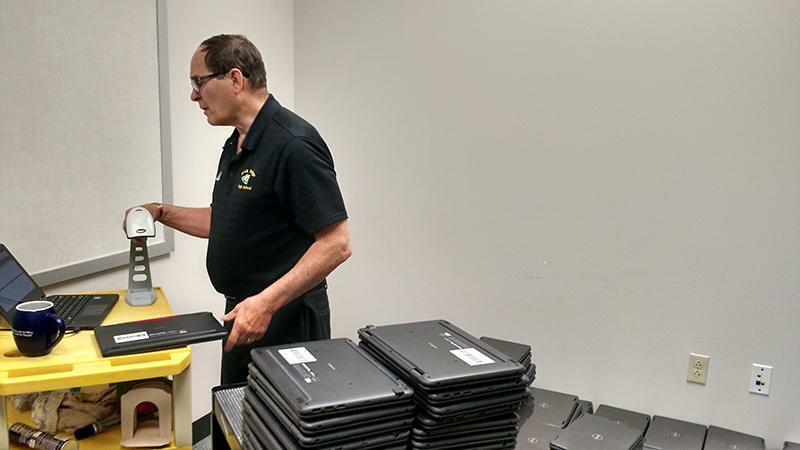 Murphy said that no student will receive the same laptop they had the year prior, but all that are turned in will be fully repaired over the summer. This way, no student should be worried about starting the year off with a sub-quality computer.